Dive into the History of Spain, with this unique cultural and gastronomic tour. Enjoy a walking tour in the narrow streets of Avila, that, besides, is the birthplace of Saint Therese. Get to know the first Gothic Catedral built in Spain in Avila. Discover the outside of the Convent of Saint Therese, the place where she spent the most part of her life. Visit the Romanesque Basilica of San Vicente. Afterwards, discover the old Roman city of Segovia, that still preserves the magnificent Roman Aqueduct from the time of Emperor Augustus. In Segovia also, see the most impressive Spanish Gothic cathedral. Enjoy a complimentary pick up from your hotel to the departure point -only in selected hotels. 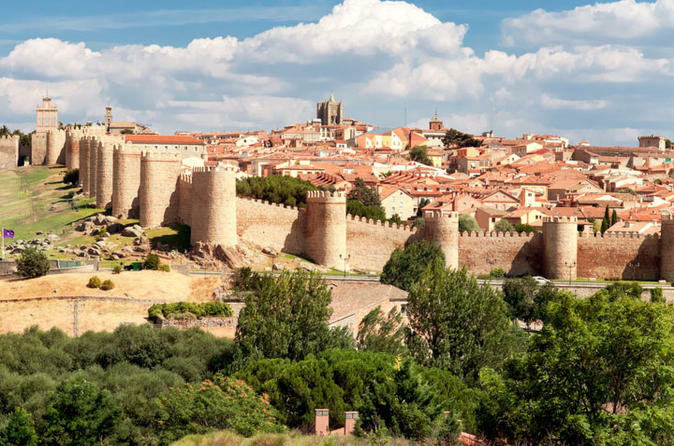 Departure from Madrid at 9:00 am in an air conditioned motor coach, and through the beautiful Madrid mountain range to arrive in the old city of Avila. At arrival, you will start your walking tour in this medieval city, to admire its unique wall, the most well-preserved medieval wall in Europe, the Plaza Mayor, the outskirts of the Cathedral, the first Gothic cathedral raised in Spain, or the convent of Saint Therese, where she spent the most part of her life, and visit to the San Vicente basilica, a very important Romanesque monument. At mid morning, transportation to Segovia, to have a typical Castilian lunch -optional. If you do not wish to buy the lunch, you can enjoy a typical Spanish "tapa", accompanied by wine, water or soda -included. After lunch, walking tour in the narrow streets of Segovia, and visit to it´s Gothic Cathedral -one of the most beautiful in the country- and the Alzacar fortress, a fairy tale castle, and one of the images of our country. At mid afternoon, return to Madrid by air conditioned motor coach.